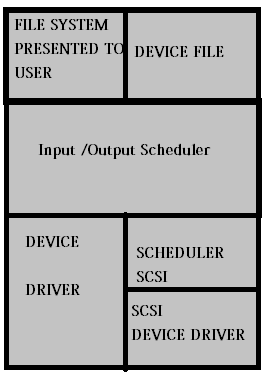 A user can do operations on these devices, by exactly the same way, he does operations on a file. The main advantage of using block devices is that, if allows access to random location's on the device. And data from the device is read with a fixed block size. Input and output to the block devices works on an algorithm called the "elevator algorithm"
This says that it works on the same principle, as an elevator would work. For example, if an elevator is going to a top floor, it will not accept any "go down" request until it completes its top floor request(of course it will stop in places in between the top floor, if there are people to get in...But they should all be going to top floor or atleast in that same direction). Mecahnical devices like hardisk's are very slow in nature, when it comes to data input and output compared to system memory(RAM) & Processor. Sometimes applications has to wait for the input and output requests to complete, because different applications are in queue for its input output operations to complete. The slowest part of any Linux system(or any other operating system), is the disk I/O system's. There is a large difference between, the speed and the duration taken to complete an input/ouput request of CPU,RAM, and Hardisk. Sometime's if one of the process running on your system, does a lot of read/write operatins on the disk, there will be an intense lag or slow response from other process because they are all waiting for their respective I/O operatins to get completed. Linux operating system, handles this problem of disk I/O in a very different way. Lets see how. There is a very famous "free" command in linux to check free RAM available. Lets see the output of free command. There are three "rows" in the output. "Mem:","-/+ buffers/cache", and "swap". Most of the system administrator's get panic, when they see this output(because they only look at the first row of the output.). According to which i only have 225 mb of memory free. But in reality i have 465MB memory free from the total of 503MB(which is evident from the second row of the output"-/+ buffers/cache"). So is that first row of the output telling me some wrong info? No. infact the first row of the ouput is also correct Let's see what's the difference. Let's run /usr/bin/time command (time command will give you the time taken to run a command)with -v option and see the ouput. if you see the second last line of the ouput, it says that "Page size (bytes): 4096". That tells that our page size is 4096 bytes. Linux operating system, breaks the I/O into pages and the default on many distrbution is 4096 bytes. Which mean's it read's the writes blocks into and out of memory(RAM) with 4096 bytes page size. Whenever an application starts, the Processor looks at its memory pages(blocks stored in CPU cache), and then RAM for the data. If data for the required application is not present in both the places, then it will ask hardisk for the data blocks. This process is called as Major Page Fault. In other words, Major Page Fault is a request, done to fetch pages from the hard disk and buffer it to RAM. And if the data is present in the RAM buffer cache, the processor can issue a Minor Page fault(which is faster, because its in the RAM, to fetch data pages from buffer cache). Major Page fault will take some time because its an I/O request to the disk drive. And minor page fault is issued, almost all of the time's because almost all data is accessed, only after they are in RAM buffer cache. So an application when started for the first time will take a little bit more time to execute because of the "Major Page Fault"(as the data is not in the RAM buffer cache, and cpu cache and needs to be fetched from the hard disk.) Let's see this practically. I am going to start "elinks"(the text based linux browser) for the first time in my system. And lets calculate the Minor and Major page fault..
And from the above output, if you notice there is not much difference in minor page faults(because that's always needed, as the kernel caches everything in RAM and then is used by the processor). So in order to reduce the "Major Page faults", the kernel tries to buffer cache as much blocks as possible, so that it can be retrieved very fast, the next time. So the output we previously saw from "free" command, is correct in its first row of output also(because a large amount of RAM is used for this buffer caching done by the kernel.). 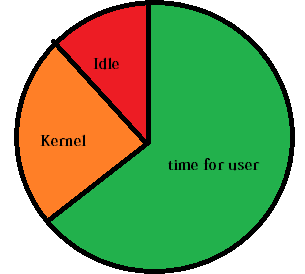 There are several system monitoring tools in linux, that can be used to monitor, I/O, usage. they are mentioned below. In an ideal situation the processor time is largly devoted to user, and some to kernel and some is idle. Which is depicted in the below diagram. Wait on I/O, is a situation caused to the processor, when there are large number of application's just waiting for their I/O operatins to get completed. In such cases, CPU becomes idle, as its waiting for the input/output request to get completed. In otherwords, some or the other application might be doing a large number of Major Page fault(which results in other application to wait for their Major page fault to get completed). Let's see how to monitor "Wait on I/O" with the help of vmstat command in linux. In the above output "wa", is zero and also the idle time is 100 percent. Which means there is nothing running on the system. If there is a case where "wa" is showing higher values, then there is an IO bottle neck. Higher wait on io means, cpu is waiting for I/O requests of different applications to get completed. "bi" column in the vmstat ouput shows the blocks that are read in to RAM from the disk. If this is larger along with "wa", then that assures you that large data is being read into memory from the disk, which is causing wait on io. SAR (System Acitivity Reporter) command in linux, can also be used to determine "wait on io"
Now in the above command, i have asked sar to populate the ouput of the system statistics every 1 second for 7 times. The %iowait will tell you the iowait time taken by the system at each second. Running this command, also will let you know about the IO stats of your system. How to identify which process is taking heavy IO in linux? For getting an overview of processes and understanding some interesting facts about processes in linux, i recommend reading the below post. you can identify that with the help of top command. By sorting the output by "page fault count" this can be done by pressing "F" and then press "u" to sort it according to page fault in top command. The above output shows that, httpd and mysql is taking the large number of "page fault counts"
iostat will provide sequential io and also random IO in its ouput. Sequential IO is the ability of the system to read a write large amounts of sequential data. (this also depends on the block size of your file system). iostat will show you the details of each of your disk partitions as shown above. devide read/sec with the readkb/sec and w/s with wkB/s to get the IO performance of the device. Another imporatant case to consider is, when you are running out of RAM. In that case, the system will start to use swap space. As swap space is nothing but hard disk space, IO speed will be very slow. And if the swap space is in the same filesystem partition where the system is accessing IO for other application's, then your system will experience a very heavy slowdown. Sometimes in the above scenario, your system will experience a kernel panic or system crash. Note: "watch" command is usefull here to provide periodic poll of commands that don't support interactive run. Its also possible to get a group output of commands ofc. very usefull info when digging into io performance problems! but 'dstat' is better than 'iostat'. Nice articles, it's very useful for me. WHAT A CLEAR EXPLANATION . THE WAY YOU EXPLAIN IS VERY WELL AND VERY USEFUL TO ME. Thank you! Great article, very informative.